K. V. Johansen is the author of The Lady (Marakand, Volume Two), The Leopard (Marakand, Volume One), and Blackdog, and numerous works for children, teens, and adults. She predominantly writes secondary-world fantasy but is also the author of some science fiction and literary criticism, and of a collection retelling medieval Danish ballads. With an artist friend, she is also working on a manga-style adaptation of a short story set in the Blackdog world. Johansen has an MA from the Centre for Medieval Studies at the University of Toronto. Her lifelong interest in ancient and medieval history and the history of languages has had a great influence on her writing and world building. Occasionally, she masquerades as an editor, freelance journalist, or book reviewer, and dabbles (infrequently) in illustration. She lives in New Brunswick, Canada with a moderately wicked dog. 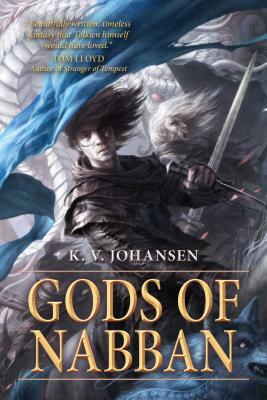 "Johansen has found a winning combination: the modern epic fantasy penchant for a cast of thousands and the golden age feeling of a tale of Conan or Fafhrd and the Gray Mouser dueling with gods gone mad." "Blackdog is an absorbing story of a man and a goddess on the run, struggling to survive against impossible odds -- all in one can't-put-it-down volume." "Her world is full of rich and vivid detail... High fantasy for lovers of mythology and of powerful beings in human form, this adult fantasy debut should appeal to fans of Robert Jordan's "Wheel of Time" series."